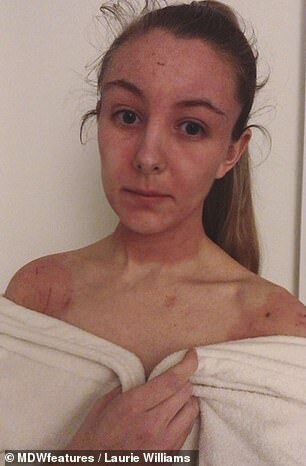 An eczema sufferer endures cruel double takes from strangers after ditching her steroid creams left her with broken, flaking skin. 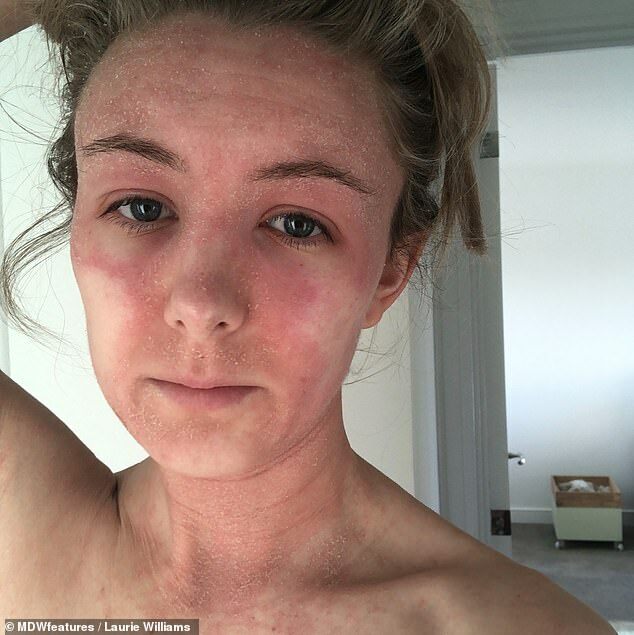 Laurie Williams, of Birmingham, always suffered from eczema on her arms and legs, but things took a turn for the worse in December 2016 when the condition spread to more than 70 per cent of her body, including her face. 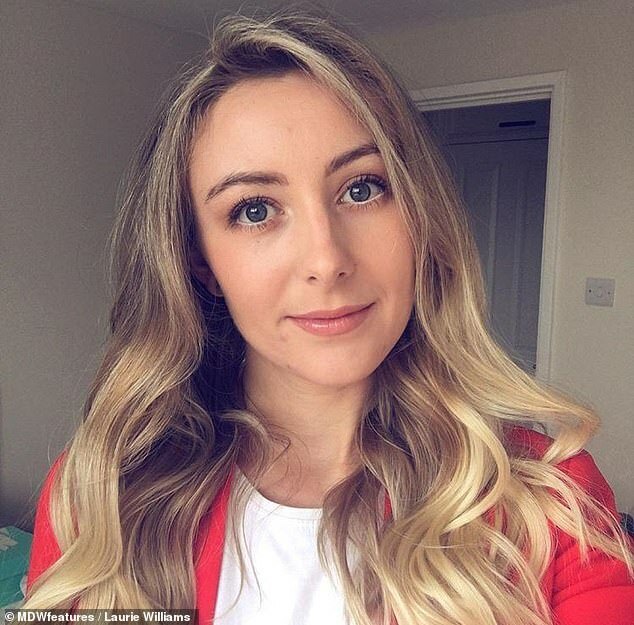 While the 26-year-old once self-treated her flare-ups with E45 cream and a bit of sun exposure, she was soon relying on harsh steroid creams twice a day. Although the lotions helped at first, Miss Williams was baffled as to why they became less effective over time. 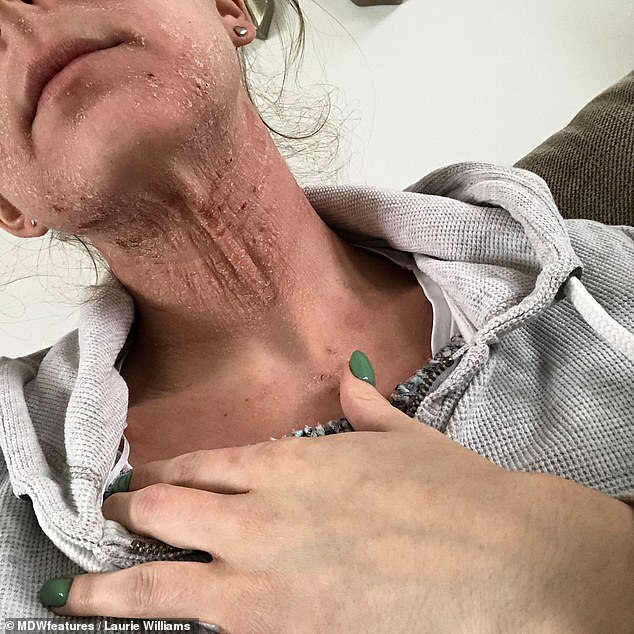 She decided to ditch the creams on January 20 and has been battling topical steroid withdrawal ever since after doing some research online. The ordeal has left Miss Williams shaking, unable to stay warm and waking in the night sweating. 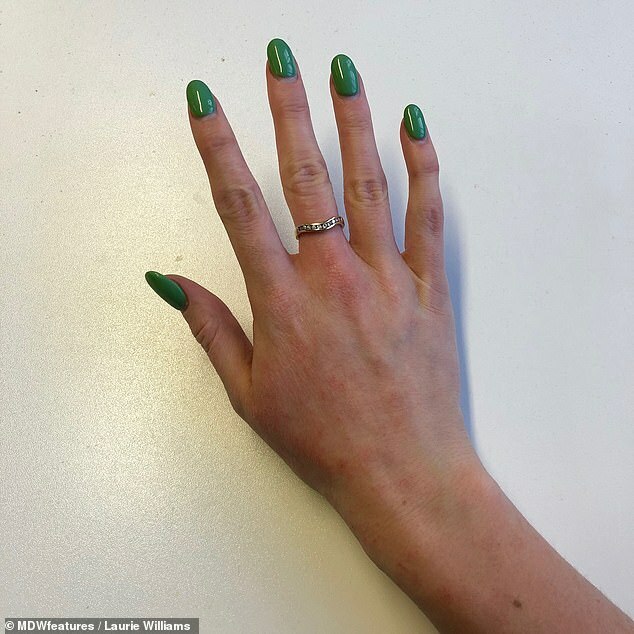 Speaking of her skin condition, Miss Williams said: ‘I’ve had eczema since I was little, but it’s always been manageable with flare ups mostly [being] in winter. ‘The furthest back I can remember is when I was about eight years old, and I just had it in the creases of my arms and legs. But at the end of 2016, Miss Williams was prescribed the steroid cream Eumovate for her face, neck, and the creases of her arms and legs. She even started applying the lotion Elidel to her eyelids. ‘I also used Metosyn, the strongest steroid I used, on my trunk and limbs twice a day before reducing down to using Elocon upon improvement,’ Miss Williams said. ‘I would also use Betacap on my scalp as that got really flaky. Miss Williams began to take matters into her own hands last summer. 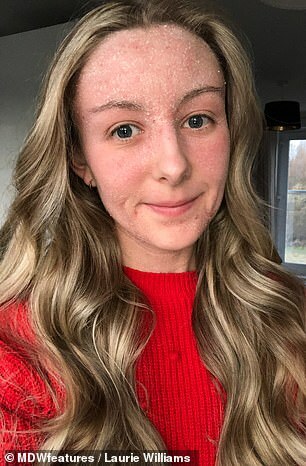 ‘At that point, I’d had eczema on my body for about two years, it had never fully gone away,’ she said. ‘I thought it was unusual that my eczema hadn’t cleared up in the lovely summer we had, so I began researching, [and] then came across TSW and the Instagram community. ‘I went back to the doctors four times over the next six weeks as I was concerned about using steroids and was given different plans each time, each continuing the use of steroids. Although Miss Williams is determined to stay positive, the effects of TSW have gotten to her. ‘My sleep was disrupted every night without doubt as I’d wake up and scratch for about 30 minutes, five times a night,’ she said. ‘I have never been a sweater, but I am sweating like mad through the night. ‘When I first came off steroids, I couldn’t get warm. I’d sit at work with a cup of tea, my coat on all day and a heater by me and I’d still be cold and shivering. It occurs when steroids have been discontinued after a prolonged or inappropriate length of administration. Excessive sweating and itching is a sign of recovery. Many sufferers also develop insomnia. Doctors should advise patients to avoid long term or high dose steroid use. As well as her symptoms, Miss Williams also has to endure the judgement of others. ‘People double take when they see me now, but that’s only natural, and some ask me what’s happened to my face and skin,’ she said. ‘I was a lot more self-conscious at the beginning than I am now, partly because my face is better and partly because I’m so used to looking the way I do. ‘However, there was one incident where I was travelling home on a train from London and it was my stop to get off. ‘I brushed down my clothes – as skin flakes fall off naturally – before I stood and shifted past the lady in the aisle seat. ‘I reached above her to grab my bags from the top luggage rack and some skin flakes fell on her. 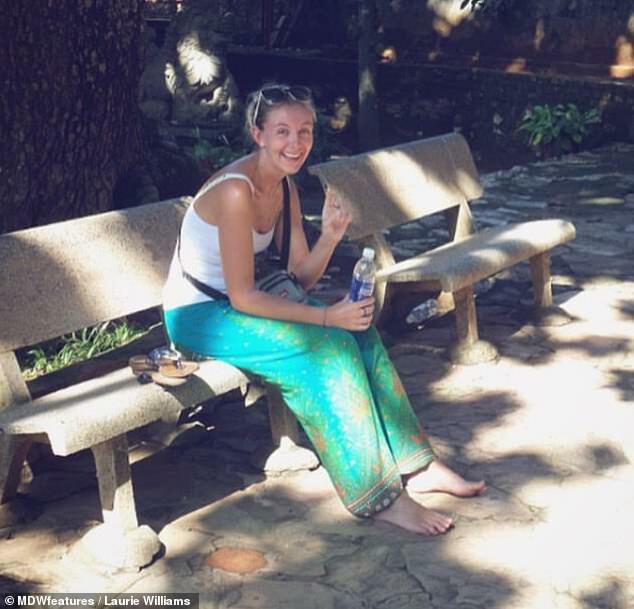 Miss Williams – who has become vegan in the hope it will speed up her healing – is speaking out to raise awareness of TSW. ‘There’s a huge support network for everyone going through it,’ she said. ‘It’s been great to hear people say they used to look like me because it means there’s hope and I can one day have skin like them. Find out more at Miss Williams’ Instagram page here.